Once upon a time, back in the 1940s, Captain Marvel was super-hero, fighting bank robbers and super-villains, much like his publishing rival, Superman. But a few legal actions later, with the Captain Marvel franchise absorbed by DC Comics, and the name hijacked by Marvel, we are left with the urgent need to reinvent the character as the name he has been known since Michael Gray first uttered the magic word on a Saturday morning more than 40 years ago: SHAZAM! 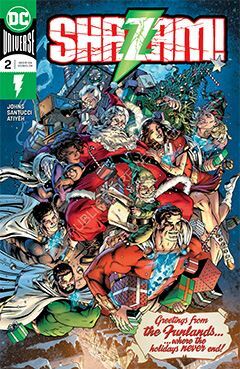 In this new iteration, Geoff Johns has re-tasked Shazam as the champion of magic, aided by his foster sister and brothers. Longtime fans might see them as analogues for Mary Marvel, Captain Marvel Jr., and the three Lieutenant Marvels. Together, they fight in opposition of the Seven Deadly Sins (even though there’s only six of them) (for now). But as they are all children to begin with, seemingly ranging in age from 10-17, it’s easy to get wrapped up in their new adventures, much like Pevensie children in C.S. Lewis’ classic Narnia books. And while exploring the Rock of Eternity, they take a magic train (hey, it worked in Harry Potter) to the magical realm of Funland. Sure, it may look like an amusement park, but any reader should be able to discern a far more malevolent agenda beneath its saccharin exterior. As the kids explore this candy-coated Heart of Darkness, Dr. Sivana is in cahoots with Mr. Mind, “a despotic magical creature with an insatiable appetite for supernatural power.” No longer a cartoon worm with a radio around his neck, he is a tiny slug-like insect communicating with Sivana electronically from inside his ear canal. There is less action and more mystery as we are given a new world of Shazam to explore. It’s only the second issue, so we’ve a long way to go. And what’s with this guy that claims to be Billy Batson’s dad?